The new face of baseball. Record-setting rookie. HomeRun Derby king. These are just some of the many titles MLB fans and players have given the Yankees’ new All-Star player, Aaron Judge. At just 25-years-old, Aaron Judge has already become a household name in the sports arena. If you follow major league baseball, you have undoubtedly heard of Aaron Judge before. Not only did he win his first-ever MLB Home Run Derby earlier this month, but Judge has also won the hearts of many baseball fans nationwide. Even some Massachusetts fans were excited to see what Aaron Judge could bring to the table in this past weekend’s games against the Boston Red Sox. 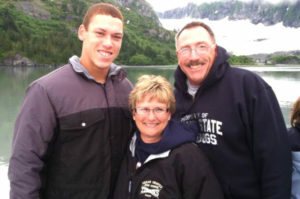 Talented and respectful, the Yankees’ VP of scouting calls Judge the “super package.” And Aaron Judge truly is, giving most of the credit to his parents, Wayne and Patty Judge, two retired physical education teachers from California. While they did not exactly give him his 6-foot-7, 275-lb stature, they did teach Aaron how to be a devoted, hardworking, respectful man from day one. Aaron’s mother Patty says that it is actually her and her husband who are truly blessed, having adopted two wonderful sons and having been able to watch them grow into such successful individuals. Of course, not all children who were adopted feel this way about their adoption story. In order to develop a sense of identity, find meaning in their lives, or fill in some missing pieces, many adoptees seek out information regarding their biology. This is completely normal. If you are an adoptive parent, welcome your child to ask questions. Give them the answers you can, in an age-appropriate fashion. Be open and flexible to your child’s needs as he or she grows. Remember that, in the end, you are his or her parents. Your child knows this, and will always love you for it. As an open adoption agency, Adoptions With Love could not agree more. Even if the adoption is closed, talking about adoption is an extremely important step for a child. Not only does it help the child’s sense of identity, it also makes way for an open, trusting relationship between the child and their parents. Having adoption conversions can also help a child accept and grow proud of his or her adoption story, which is very central for a positive adoption experience. Whether you are an adoptive parent, birth parent, or an adoptee, know that you are not alone. 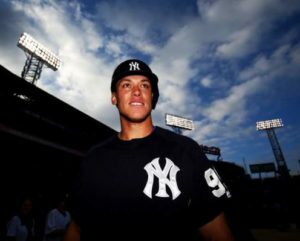 Millions of people have been touched by adoption in some way – including famous athletes like Aaron Judge. If you would ever like to talk about adoption in a safe and confidential space, or simply learn more about the positive act of adoption, you can always call Adoptions With Love toll-free at 1-800-722-7731 or text us at 617-777-0072. You can also learn more about the experience of adopted persons by downloading our free eBook here.